Belle maison d'hôtes spacieuse 638 sf, avec cuisine complète, salle de bain complète avec baignoire et une chambre spacieuse. Wi-fi, 2 téléviseurs à écran plat, DirecTV avec HBO, le chauffage et l'air conditionné. Très tranquille et sécurisé. Il ya un Starbucks 2 pâtés de maisons et d'un restaurant thaïlandais, Papa John, massage et 7-11 un pâté de maisons. Il ya une laverie automatique 3 pâtés de maisons. Il ya un parc de 2 pâtés de maisons où vous pourrez vous détendre, faire du sport ou tout simplement profiter de l'air frais. She agree to refund for one night but charges for cleaning fee ??? Will definitely not or recommend this place or this company for any rental . The guest was not feeling comfortable staying at our guest house so, even though I have a strict policy of non refunded once staying, I decided to refund the guest and only charge them for one night and the cleaning fee. The total I kept was $190 and I issued the corresponding refund guided by a Homeaway specialist. The total payout I received from the guest is $760.13 so I issued a refund of $560.57. Now I received a chargeback from Homeaway stating that they will collet $255.10 from my account because the guest disputed the transaction. So basically they will make me pay $55 for lodging a guest one night and clean the place affter they leave. I understand that the tenant paid much more than the $760 that I received on my account but it should be Homeaway returning the fees they collected or explaining to the guest if the fees are non refundable. A host cannot be paying for a guest to stay!!!!!!!!!!!!!!!!!!! This is unacceptable!!!! Amaxing property owner. Spacious, friendly and peaceful!! Great area close to all necessities. Property is well kept up, had all needed essentials, friendly owner, quiet and peaceful. GREAT area and nice area to relax under the crisp night air! Thanks for making our vacation peaceful and relaxing!! The property was very clean. The pictures provided were true depictions of the guest house. There was plenty of on street parking available. I would gladly return to this location on future visits. the property was as advertise roomy , parking good, and close to my grand daughter. .negatives the place smelled of cleaner for the whole time, they let there dog out and it pooped next to the walk and never picked it up, and there were many small ant every where especially in the bathroom. we may book it again. 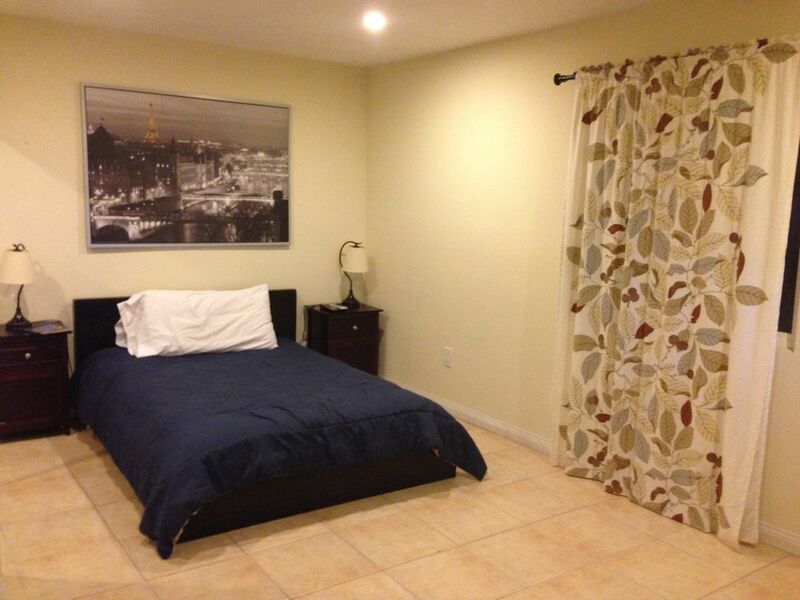 Comfortable, clean and very spacious in the NOHO, Studio City area. Close to highways, restaurants, many activities. There is a large kitchen area, that would benefit from some new cooking utensils. Although, with all the great restaurants nearby who wants to cook! The water heater is small so space your showers. It was cold when we visited and the space heaters do an adequate job of keeping the place comfortable. Plenty of street parking available in a quiet residential neighborhood. We will be back!